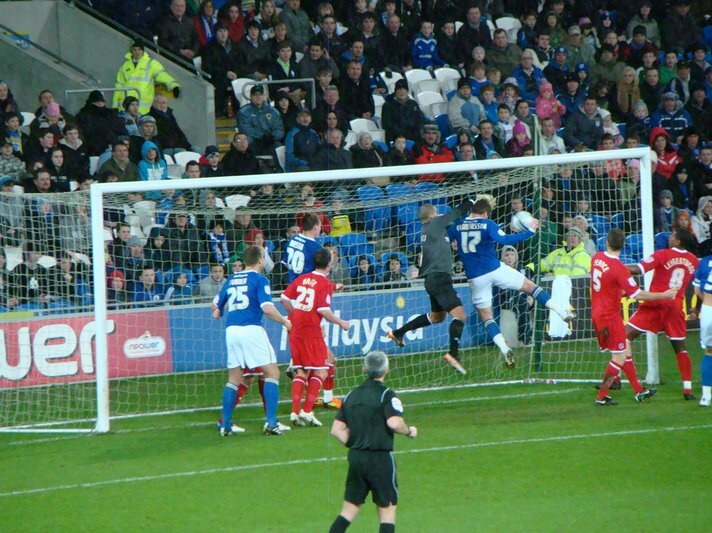 The Bluebirds stormed into a three-goal lead inside 36 minutes courtesy of Joe Mason, Aron Gunnarsson (right) and Kenny Miller. Former Cardiff midfielder Jobi McAnuff pulled a goal back for Brian McDermott's Reading on the stroke of half-time, but it proved immaterial as the home side cruised through the second period to move into third spot. Mackay said: "Some of the passing, movement and chances in the first half were sublime. "I'm delighted with the way we played especially on the back of a tough game on Saturday. "In fact, I thought we grew as the game went on. "We want to be as high up the league as we can be. But we'll concentrate and focus on ourselves. When you start looking at others then you can take your eye off the ball." Republic of Ireland Under-21 international Mason opened the scoring with a superb solo effort in the 13th minute. Mason collected Miller's pass and, after almost losing his footing on the greasy surface on the edge of the box, drilled a low right-footed shot past Reading goalkeeper Adam Federici into the bottom corner. It was the first goal Reading had conceded in 408 minutes and the 100th league goal at the Cardiff City Stadium. Cardiff doubled their advantage with a hotly-disputed second when Gunnarsson headed Peter Whittingham's corner in from inches rather than yards. But Federici saw appeals for a foul on him as he stood on his goal line waved away by referee Chris Foy. Things were still to get worse for the Reading stopper as Whittingham's excellent defence-splitting pass found Miller who toe-poked home from 10 yards. This was payback for Cardiff, after Reading ended their promotion hopes last May with a 3-0 play-off semi-final win. Cardiff midfielder Gunnarsson said: "We started well and scored three goals in the first half. It was comfortable, but we made one mistake and they were back in the game. "We ground out the win in the second half and it's a good result for us with other teams losing. It's fantastic and we have to keep going. We need to keep believing in ourselves as it was a brilliant team performance." Reading's consolation goal came when Jimmy Kebe galloped down the right and his cut-back found opposite wideman McAnuff, who fired past David Marshall and defender Mark Hudson on the line. Yet it mattered little as Cardiff cruised through the second period to start 2012 with a bang. Reading manager McDermott said: "We didn't perform and that is the disappointing thing for me. "Give credit to Cardiff, who have beaten us twice this season. We have to move on quickly."